She's one of New England's 10 best free attractions, and she's a Guinness World Record holder. But what on Earth is Eartha, exactly? Eartha is the world's largest revolving globe, a creation of DeLorme, an innovative map-making company that was headquartered in Yarmouth, Maine, from the time it was founded in 1976. DeLorme was purchased by Garmin in 2016, but Eartha remains open to the public. Designed by former CEO David DeLorme and constructed by DeLorme staff, Eartha is a technological marvel and a wondrously detailed, three-story, three-dimensional representation of our planet and its movements. Like our Earth, Eartha tilts at 23.5 degrees, and she rotates on an "axis," a specially designed cantilever arm. It took more than a year for DeLorme cartographers to compile the data used to create this giant globe, which occupies Garmin's three-story lobby and is open free to the public weekdays year-round. In these photos, taken just prior to Eartha's tenth birthday, you'll see Eartha up close and learn more about her creation. DeLorme may be gone, but this three-story globe—the company's most massive achievement—spins on. This free attraction in Yarmouth, Maine, is open to visitors year-round. Kids love Eartha, the world's largest rotating/revolving globe. Eartha is so large, it is visible from I-295, but it's so much more impressive up close. Just How Big IS Eartha? As you can see from this photo, Eartha towers over my 5-year-old. According to Guinness Book of World Records official measurements, Eartha is 41 feet, one and one-half inches in diameter. "Eartha is the largest image of earth ever created," according to the company that created her. No need to worry about craning your neck to see the continents as Eartha slowly spins. This photo was taken from the second-floor observation level. There are three observation floors in all, accessible via elevator or stairs. 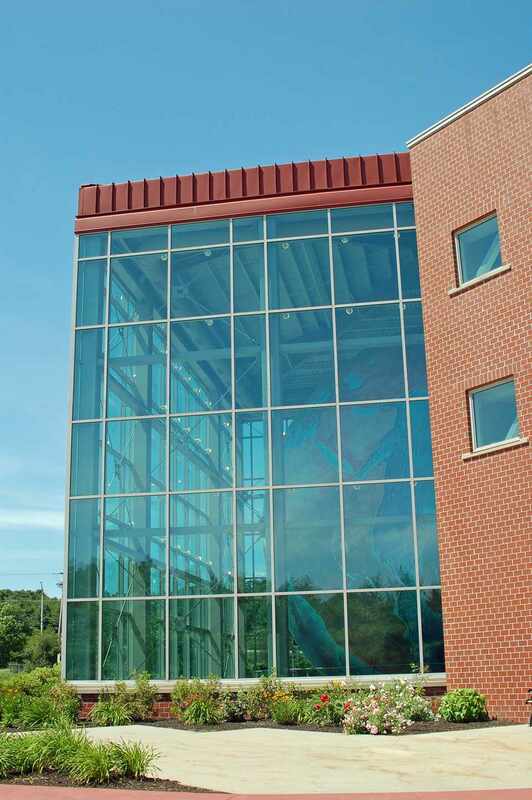 The third-floor observation level at DeLorme gives visitors a view of the top of the world. Here, Europe and Asia rotate into view. Eartha serves as a giant geography classroom for kids. We helped our daughter spot Italy and other countries. 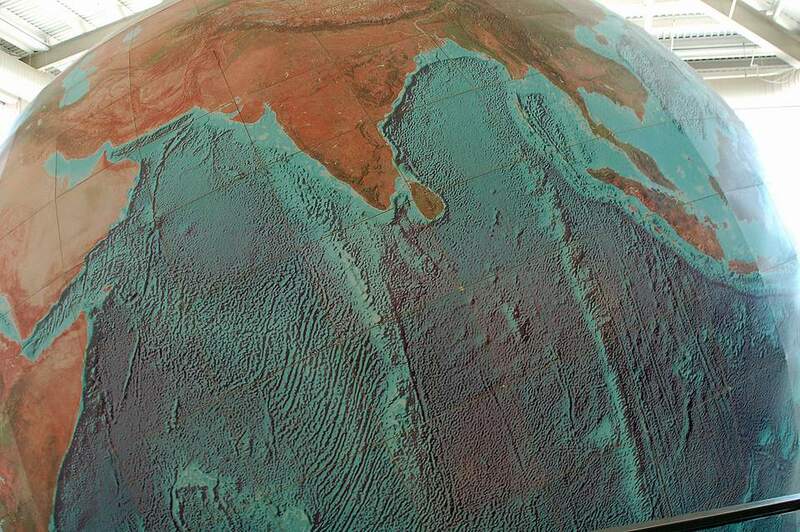 As you can see from this picture of the North American continent, Eartha is fabulously detailed. DeLorme staff compiled mapping data from a variety of sources—from satellite images to ocean depth readings—to create this realistic depiction of Earth. A visit will allow you to appreciate our planet in new ways. Look very closely in the lower right corner of the left-hand grid box, and you'll see the curved arm of Cape Cod. That should help you to get your bearings as you view this close-up of New England on Eartha, the world's largest globe. The DeLorme Map Store closed in February of 2016, but Eartha remains on view weekdays year-round in Yarmouth, Maine, at the Garmin office building, where many former DeLorme employees continue to create groundbreaking mapping tools like inReach: the product that caught Garmin's eye and led to the purchase of this legendary Maine company.